I have a requirement in which suppose if someone adds an item in List, item details should be automatically updated to Excel/Csv file which has same column names as list. This Excel/csv file can be in a library or on file system. Is this possible? I have googled it a lot but could not find anything. The Excel file can be created for you automatically - there is no need to make a new Excel file yourself with headers to match the Sharepoint field names. Try this: use the Export to Excel feature to take an extract of your list. Save the Excel file, do not break the link (Unlink) - this will maintain a connection with changes made to the List. You can upload your file and store it in Sharepoint so other users can share it. The file can be refreshed with any modifications coming from the linked Sharepoint List. To test refreshing the data, make a change to an item in your linked List. 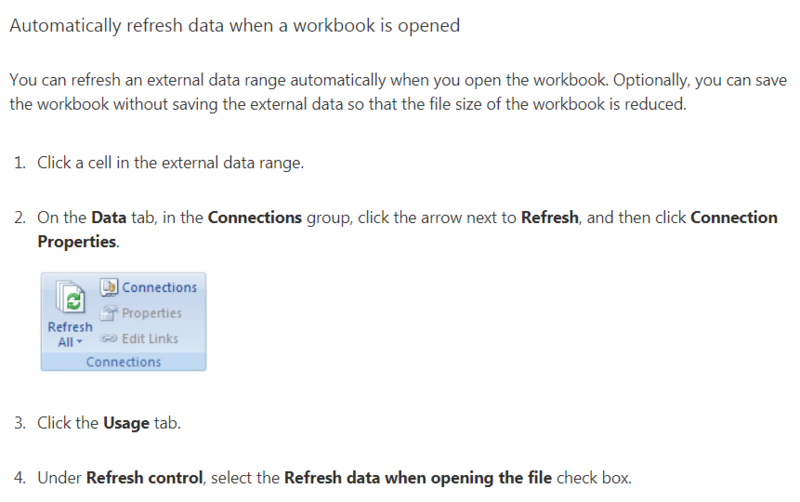 Then open the Excel file and select refresh all - Excel will update to match with changes made in the List. If you use the linked Excel file to create graphs, you can set up your file in such a way that the graphs will update when new data is available in the List. When you refresh the file, it will refresh your graphs too. Very useful for reporting of e.g. monthly KPIs. Make the Excel file auto-refresh when the file is opened. See this link for details. Not the answer you're looking for? Browse other questions tagged sharepoint-online sharepoint-designer rest jquery or ask your own question. How to have a list auto update once a week and then email the people in the list?